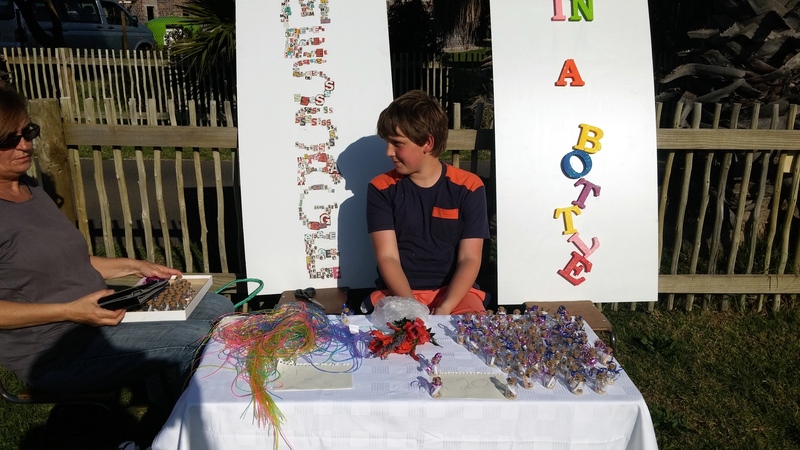 We had a lovely Youth Day market at Imhoff Farm on 16 June, many thanks to Imhoff for having us at their delightful venue. The weather played along too thank goodness! We had 20 stalls and 26 official traders although some “visitors” also joined the fun. The youngest trader was just 4 years old and the oldest 16. I thought the atmosphere was great and I was really pleased to see such good presentation and also lots of refinements by those who have attended workshops. As always picking a winner is the toughest part of the day, everyone was so fantastic. 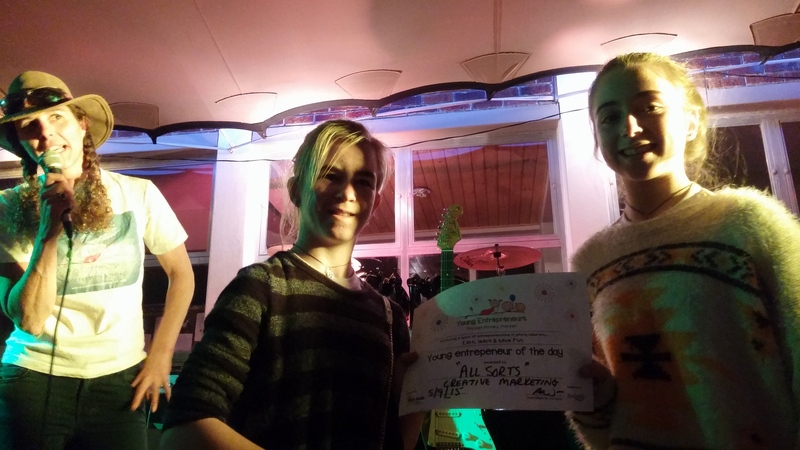 Congratulations to Kaira and Stella of Cupcakes, Critters & Crafts who won Entrepreneurs of the Day. Their advert was lovely, they sold very well (in fact sold out) and had a fantastic attitude too. They also handled a couple of mishaps with aplomb and all the “secret shoppers” were very complimentary. 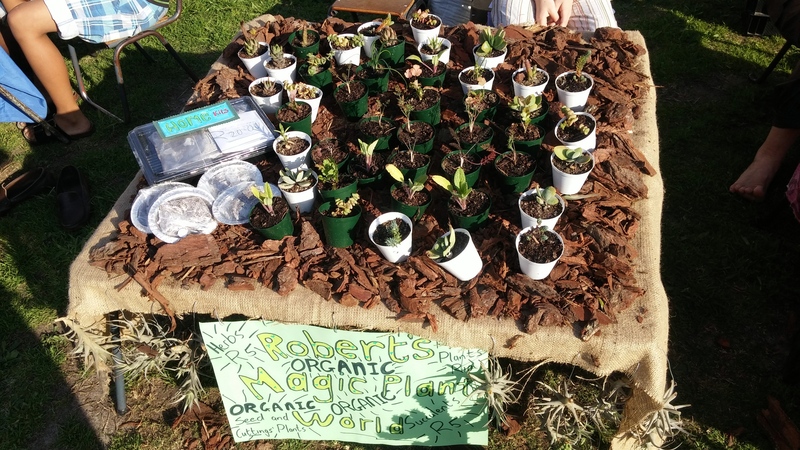 Highest earner was Robert’s Organic Plants (by a long way! ), followed by Hannah’s creations with Kaya and the Soap Cellar joint third. Well done! I am very pleased to see the detailed costings and improvements from the regular traders. On that note some sheets were incomplete or poorly done, they will not be accepted like that again so please take note! 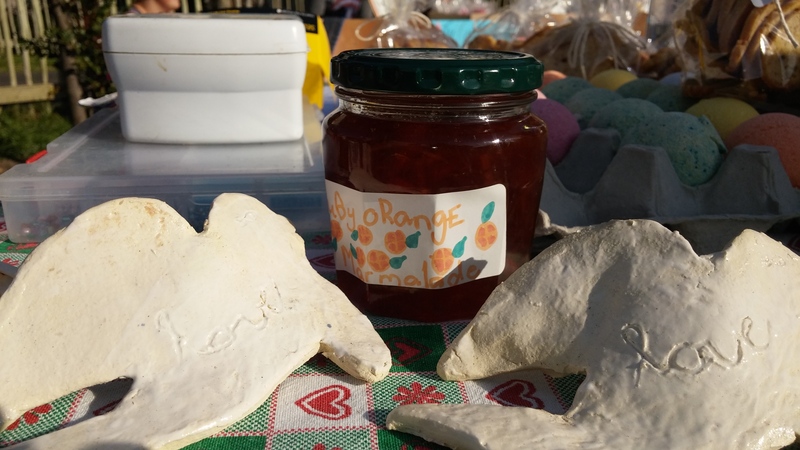 Special mentions to the Soap Cellar for outstanding products, costings and a fabulous stall. Also to Colour Me Crazy for excellent presentation and Hanna’s creations for lovely original products. For those wanting figures, one trader had a net profit of over R500, 6 traders had a net profit over R300 and another 5 over R200. Considering this is after costs and the kids are between 4 and 16 I think this is pretty good! I am available on skype or you can come and visit if you need some help getting there…this is a safe space to try out all the ideas. I will do the other awards in the holidays instead of month end this time…I am looking at 13 July (see below). I need some time to study the sheets and think things over to do the awards in more detail, market days are getting pretty hectic. If there is enough interest I will do a workshop in the holidays on Wed 13 July from 2 to 4pm with awards after. We should be all done by 4:30 but the kids generally like to socialize a bit and weather permitting I’ll organize a fun activity again. I am flexible with dates but can only do afternoons and evenings so feel free to get in touch if you have an alternative suggestion. Remember workshops are free for traders and any group of 5 or more can initiate one. The winner of the LUCKY DRAW was Enid Pemberton. Congratulations Enid, I have mailed your four tickets to Snow World to you, enjoy and thank you for supporting the Pocket Money Market! 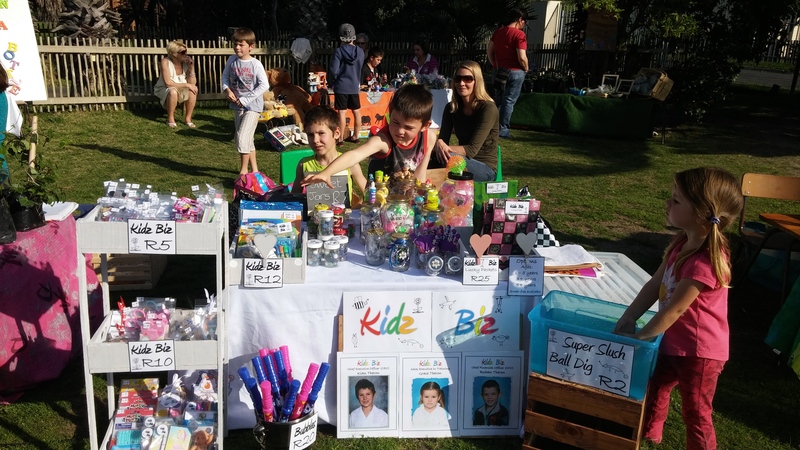 The lucky draw was a great selling tool for the kids and as each sale = a ticket I think it really boosted sales. If anyone has connections for another prize that would be awesome…even if a company wants to sponsor something smaller like movie tickets or a voucher…anything would be most appreciated! Below are some snaps of our traders…in no particular order….Apologies I was a bit busy so didn’t take many pics and I missed a couple. Please send me your photos! Or better still I am hoping for a young photographer (Hannah?) and a young reporter too. I could really use some help on market days too if anyone is keen, plus admin and PR too. Many thanks to Nikki Mountified for her hard work as well as Leigh Palmer for coming to my rescue when I could not fit the tables in my car! My continued thanks to Rotary for supporting the market, I saw a number of their members shopping and to SNOW WORLD for their fabulous prize worth R480! Until now I have collected the stall fees at the end and adjusted down where takings are on the low side. However its too chaotic to manage so all fees will have to be paid up front from now, unless you make a special arrangement ahead of time. If any children do not earn enough I will be happy to credit them but this will be done at a later stage when I have time to assess properly. ( I work on not more than 20% of net income as a guide) Please remember you may apply for charity dispensation and outreach stalls are at no charge. I also have some start up assistance available for outreach too. This is a non profit, I do this in my own time “for the love” and self fund but I am really battling to stay afloat. Certificates, prizes, and a host of set up costs need to be paid, plus each event takes about 5 working days to set up. I work full time too so its not perfect, but on balance I think still worth doing. If anyone is able to assist in any way…nothing is too small. Printing is a constant expense and posters, accounting sheets and certificates are essential. It is my dream to get a proper sponsor and “do it properly” – I have a document prepared if you have any ideas! PS sorry this is not a very pretty report…having a glitchy day and nothing wants to go where is should…but the basics are all there. I am absolutely thrilled to announce we have been given a great new venue! 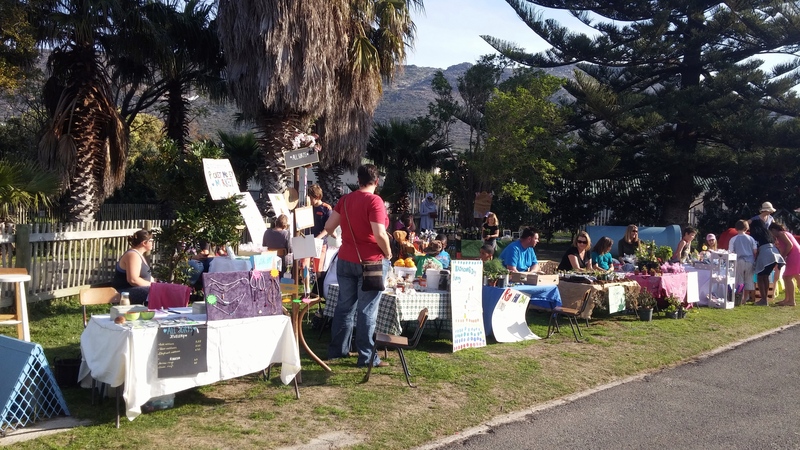 We have 10 stalls every Thursday at the fabulously popular Cape Point Vineyards Community Market. The first one is already on 4 Feb so please help me make the most of this amazing opportunity by booking a stall. Bookings are open for 4, 11, 18 and 25 Feb here: https://docs.google.com/forms/d/1sX_5GJAh7sJr4iNLBf7FjfGHipEpuPmgs9muWOODp0c/viewform Please complete the form with all details, otherwise you application cannot be processed. Trading will be from 5 to 7pm, older chidren may trade on later if they wish. Setup details will follow, we need to be mindful of traffic as this is a BUSY market. Applications will work on first come first serve with some preference to those who attended in 2015 if we are oversubscribed. If you wish to attend more than one a month that will be possible if all applicants have been accomodated and there is still space. 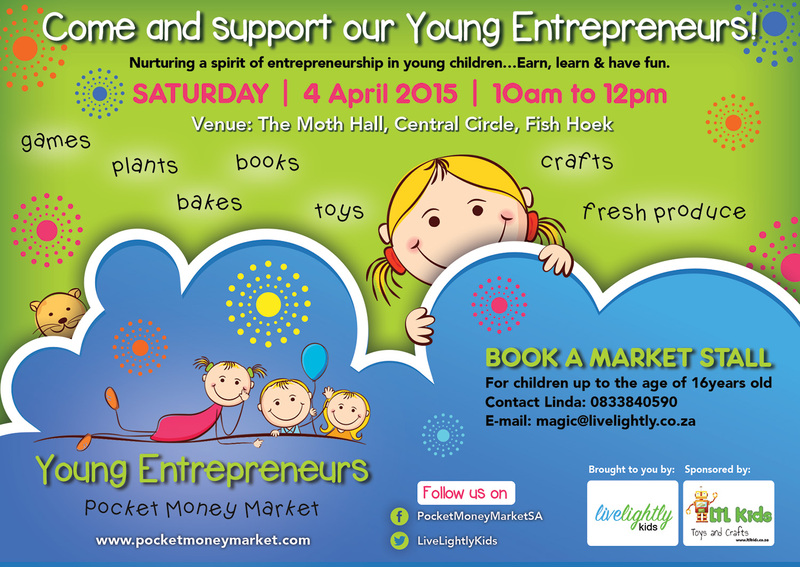 Stalls are R50 for one or 2 children and an extra R10 for additional children. Tables are provided at this venue. Please note some details may change as we are still in the trial phase at this venue. We may not clash with existing vendors, details are in the booking form. ACTIVITY STALLS ARE ENCOURAGED. I prefer to avoid “made in China”. Please note electricity points are not available. 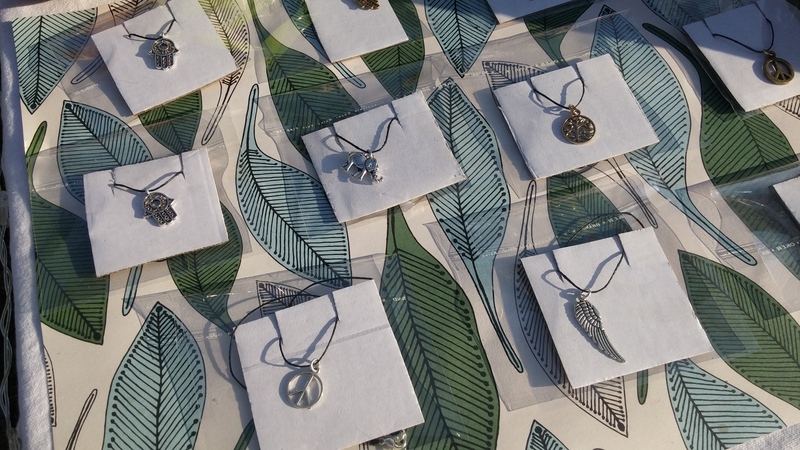 I would encourage a variety of items for their first market to get a feel for what sells. Plants, veggies and herbs, crafts, activities like guessing the number of sweets in a jar, temporary tattoos and nail decoration are all fun and easy. I suggest keeping some items small and simple and selling them at lower prices but a few larger items with a higher return help to bump up profits a lot. Awards will take into consideration things like the originality of the products, cost of production, how much parental assistance is required, display, salesmanship and profit, among others. Recycling, upcycling and creativity are encouraged. The young children battle to concentrate for two hours so I advise keeping the set up time minimal and stalls simple. The children will get a simple sheet to complete with expenses, float, takings and profit. This is compulsory as the aim of this project is to educate. As this is an evening event, accounting forms can be completed at home and returned via e-mail. Certificates will then me emailed back unless you prefer to collect at a later stage. Awards will take place monthly and winners will be given opportunities to trade at the bigger events in the year and a early booking option for each month. I am looking for children who would like to become Pocket Money Market photographers and reporters too. As always feedback, suggestions, help and sponsors or donations to costs and prizes are welcome as are volunteers to assist with the outreach children, graphic design, PR and loads more! Many thanks to Cape Point Vineyards for this fantastic oppotunity. I look forward to seeing you there. Sooo, I must apologise, I am about 3 reports behind. I’d love to do them with the amount of detail as I used to, but Murphy’s Law, whenever I plan a market some paid work turns up and that has to take priority! 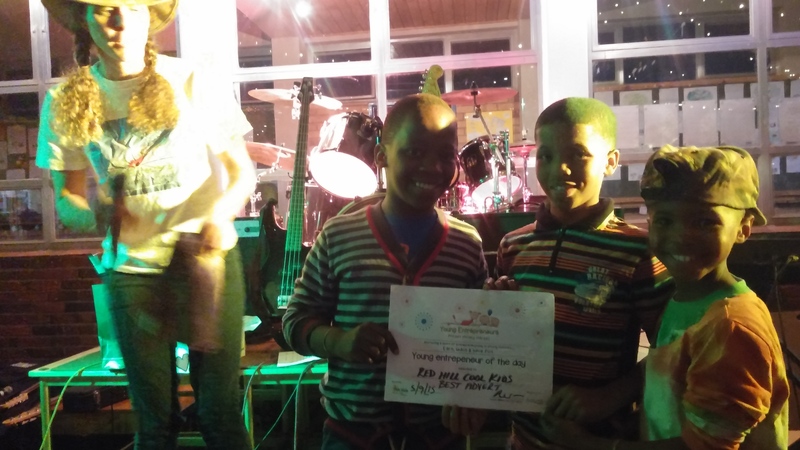 So rather than get even further behind, here is a short report of the 5th September Pocket Money Market at Bay Primary and another call for Young Reporters, Young Photographers and Young Film Makers to take up the challenge! I have had coverage on radio and TV so it’s a great platform just sitting there…waiting for you. Many thanks to all, especially those who travelled so far. We had people who came from far and wide which was amazing. 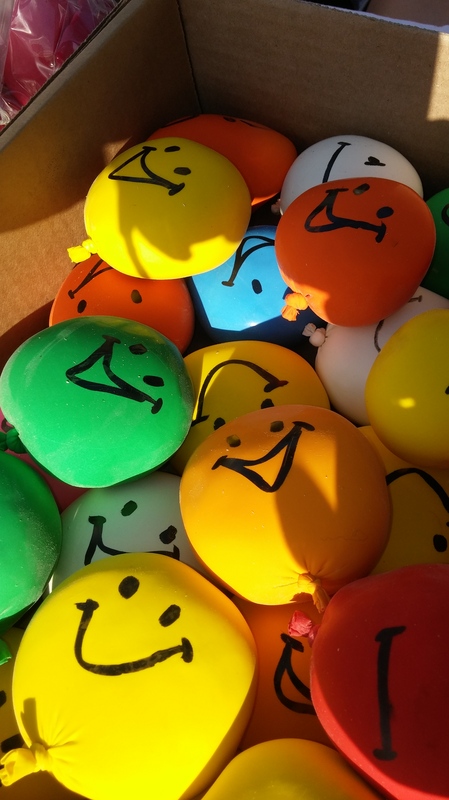 Great kids, clever products and a fun day. It was the first time I have joined another event so a learning curve but on the whole all good I think. 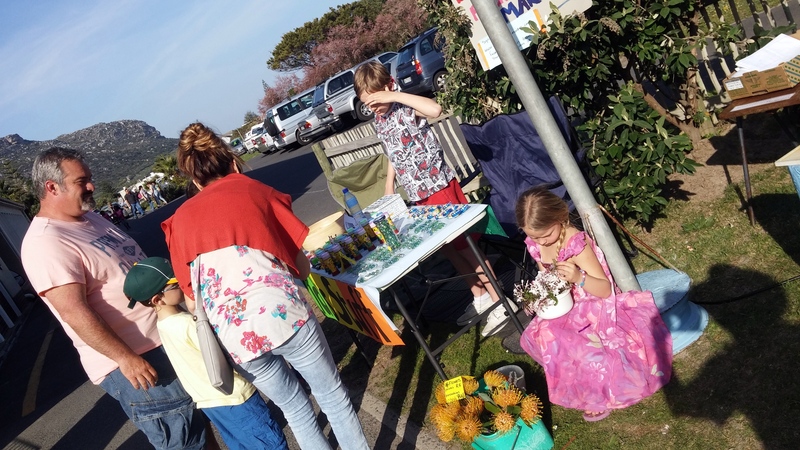 As it was a food fair fundraiser, the Pocket Money Market could not sell food…quite a limiting factor. Lots of green fingered folks out there however and there were plants galore! 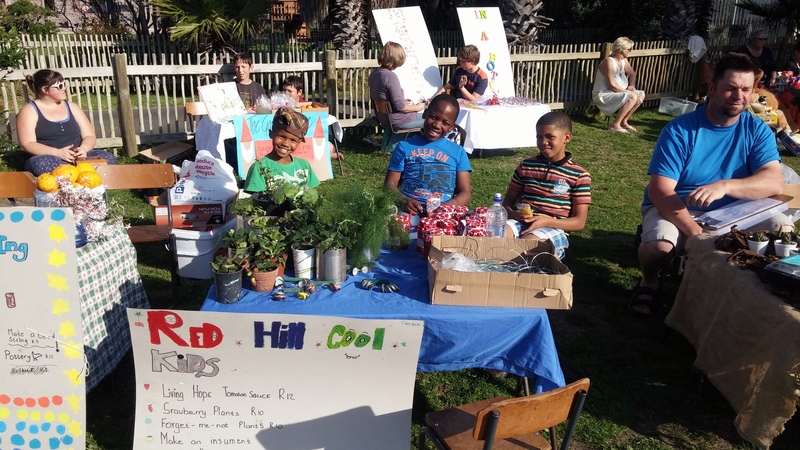 Red Hill Cool Kids: Khanyo, Jeremiah & Edrige…Our first outreach stall. They made R180, reinvested R30 and took R50 pocket-money each…small beginnings of big futures. 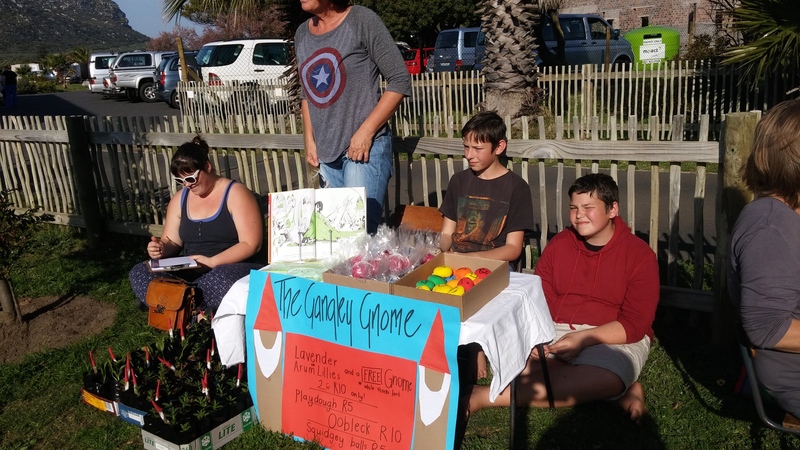 Kid’s Stuff: Michael, Stephen and Lisa…Awesome profit of just under R600. Well Done. And big thanks to mum who really worked hard too! Winner of the best display…First boy to win this ever. Well done Robert! Half an hour before the market opened and everyone was finished setting up already…First time ever. I do always try to warn everyone that kids can’t really do more than 2 hours, I’d advise actually setting up later to be honest. 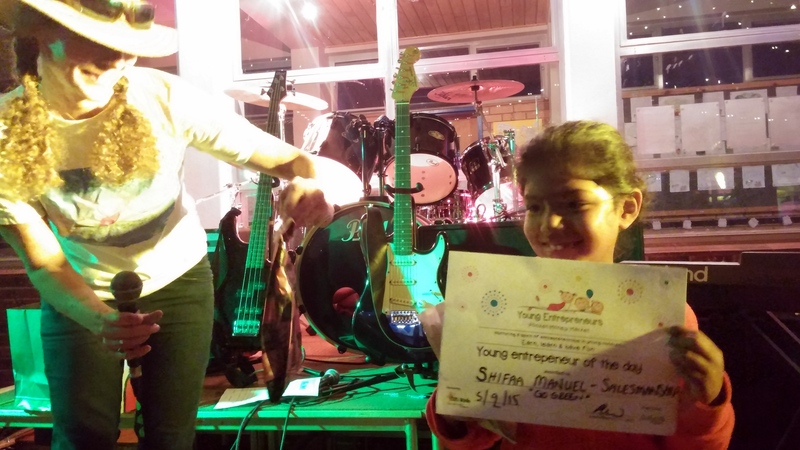 Shifaa won a salesmanship award…totally knows her plants and gift of the gab! Well done! Isabella and Ruby “All Sorts” Marketing Winners. Michael and Stephen: The Gangly Gnomes. I love these clever Ideas made from things that cost nothing! Katie of Crazy fun cartoons…a very cool concept, well done! If anyone is keen for a market in your area please get in touch. Our format includes basic age appropriate costings and profit calculations, a premarket advert requirement which can also be their market sign. Awards are based on creativity and salesmanship among other things…judging is not so much about earnings. A nominal “rental fee” of R20 introduces the concept of overheads. Children from age 3 to 16 are welcome. Each child gets a certificate of participation so there are no losers. As always I am constantly looking for sponsors, partners and feedback. I am passionate about this project and even more so about the new outreach part of it. Next date is Sat 24 October with a big outreach craft session in the morning and a market in the afternoon…LOADS OF VOLUNTEERS needed of all ages. Donations of cash or anything we can use to make things with and ideas all welcome, I plan to stock 10 outreach stalls for 40 children. I hope to make it a fun day and all the kids can get together too. Busking and performance art spaces will be on offer and as always any fundraisers are welcome for free. Please check out the pics on Facebook https://www.facebook.com/media/set/?set=a.1652328258316314.1073741837.1591673784381762&type=3 and give the page a like and share. For those of you on Twitter check out https://twitter.com/LiveLightlyKids too. In closing, I run this with pretty much zero resources, sometimes on borrowed bucks and my sister Nikki is my team. It’s a real dream to take it up several levels and I have grand plans. My joint aims are to empower a generation of independent earners with more choices while bringing real income to needy households via the outreach arm. I really believe much of the crime committed against children happens because their parents spend such long hours working and commuting leaving children unsupervised, and if we could generate home based income this would make a meaningful difference. Apart from the obvious lack of jobs which makes self employment a necessity. I do, however have to earn a living so this gets odd scraps of time (Yes its 1am as I type this) and its far from perfect. But at least its happening…my two refrains are “Use what you have” and “Nothing ever happened sitting on the couch.” Seeing what a big deal the first earnings they took home was to the Red Hill Cool Kids has already made it a win for me. But I do need help…do-ers not talkers though. So if that’s you, give me a shout on 0833840590. You can check out the links to my qualifications and back story in the “About” section of this blog and let me know if you want to see the “masterplan”. Bank details are optimistically there somewhere too. Thanks a mil for all the support so far! Oh one last thing…I am crowdfunding with Greenpop to get to Rocking the Daisies, please donate a tree if you can at R120 http://www.givengain.com/activist/144447/projects/11178/ One of my fave bands is out from Aus – The Cat Empire…am determined to get there. Sjoe…if you read this far, well done! Thanks. 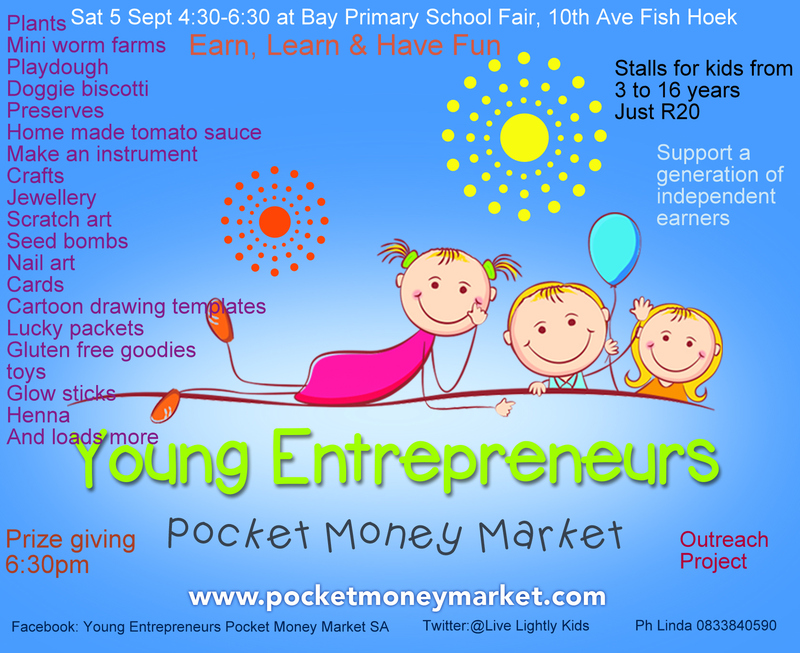 The stall bookings for the Easter Pocket Money Market are now open. Please use this Booking Form or mail magic@livelightly.co.za. Times have been tweaked a bit to accommodate the road closures for the Two Oceans Marathon so that should not be an issue. Sat 4 April 10:00 to 12:00am, awards 12:15 – 12:30. Children up to 16 years may participate, there is no minimum age but I think from around 3 years is best. I would like to make part of the stage area available for some music and performing arts slots, I think about 15 minutes each. It would essentially be a busking slot…I am thinking they can join in the Young Entrepreneurs and get certificates, etc too. A 15 min slot will be R5 and they can book more than one, either consecutive or at different times. I will also share some crafty ideas on the Facebook page if you need inspiration and please feel free to share yours, whether you are joining us or not! 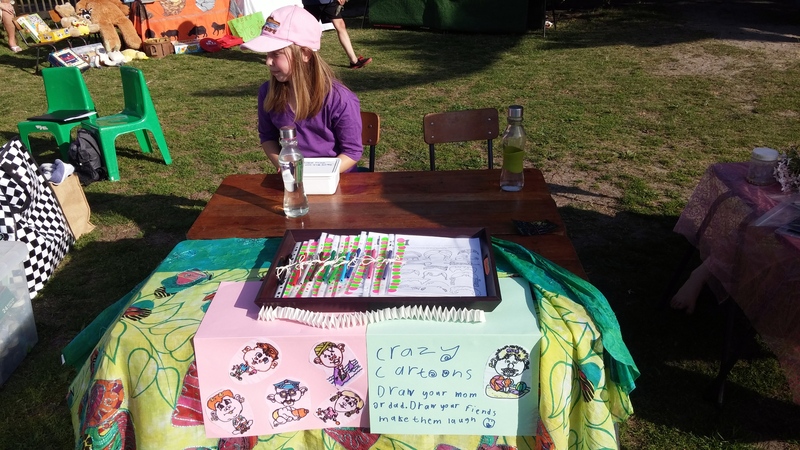 I am proud to say that the Pocket Money Market concept has been followed around the world and I have had interest from mums in Canada and Australia, so let your children use this platform to showcase their skills! Many thanks to Lights that Last for sponsoring the cost of the venue & their incredible support. Thanks so much to Michelle Beattie for the lovely logo and graphic design work she has donated! I look forward to seeing you all there.